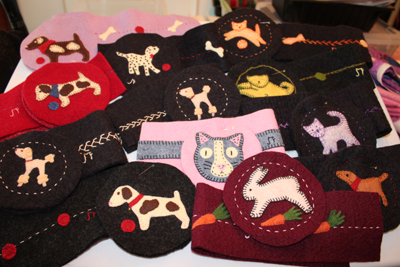 front are some of my penny-rug style pincushions. I am back to creating pincushions for my only scheduled sale this fall and holiday season. It is to be at Maria Wulf and Jon Katz's Bedlam Farm annual Fall Open House the weekend before Columbus Day, October 6th and 7th. It is an event not to miss!! There will be all sorts of outdoor activities and Columbus Day is when Leaf Peeping Season is usually at its peak! It is a beautiful time to be outdoors and taking in Vermont and Upstate New York's beautiful fall foliage colors! Each year, I have been privileged to be invited as one of the artists to participate in Maria's Schoolhouse Studio Sales! It has become an annual challenge for me to create a new line of pincushion for this special fall event. This year I have decided to create a limited number of "Household Pet" Penny-Rug Style Pincushions. Each one is different and features a dog, cat, or bunny. 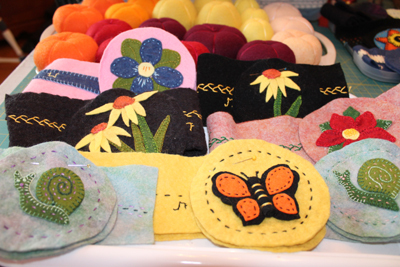 Each is a one-of-a-kind in design, hand-appliqued, and hand-embroidered felted wool pincushion. I have also created a snail penny-rug pincushion in memory of Socrates, who was Maria's infamous snail that she blogged about on her web-site. Snails don't typically live long lives and so I was glad to hear that Maria continues to have a household snail pet, though her original Socrates Snail's memory lives on, and has inspired some of Maria's and my artwork! as all hand appliqued, hand-embroidered and individually designed. I took several "sneak peak photos" of my pincushion production. I have a "batch of fruit pincushions in the making". These will have stems and leaves and look like the "real deal" soon. 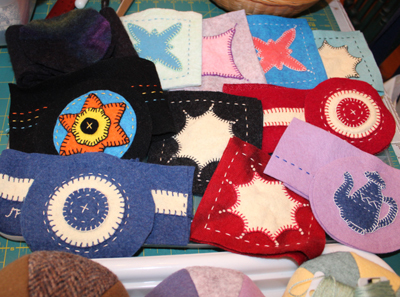 I also have two-tone wool pincushions (see below for a sample of these when finished), biscornu pincushions that will be biscuit-shaped when they are finished, other penny-rug floral pincushions as well as the more traditional penny-rug style pincushions. My production does not include my flower pot pincushions, silly chicken pincushions, and owl pincushions as they are already made and waiting to go. After Maria's sale, whatever is left over will be listed and featured on my Etsy shop site, LittleHouseHomeArts. to be embellished with pearl cotton wrapped seams and buttons. For those that are not familiar with penny-rug style art. It originated in the 1800's. People would make penny-rugs out of old wool garments. People actually wiped their feet on them before entering the house. Each rug was made of circular medallions using coins as templates and appliqued them to a wool mat using a blanket stitch. Each medallion had a penny sewn inside of them, hence the name penny rug. This kept the mat durable and heavy enough to stay put. As the individual wool circular medallions wore out, they would be replaced with others to keep the mat functional. Eventually penny rugs became fancier works of art made with scraps of colorful wools and embellished with hand-appliqued designs and embroidered stitches and while they were still often made with circular medallions, they no longer made them with pennies sewn inside of them. They were no longer used on floors nor used as door mats to wipe your feet on, but rather placed on tables and chests and backs of furniture to decorate your house. It should be noted that anything made out of wool needs to be kept out of direct sunlight to prevent fading, unless you don't mind the faded look and simply keep them dust free by using a tape roller to gently remove dust. The prices on these items are kept as low as possible. Sadly there are no more woolen mills in this country, but I have been fortunate to obtain wool by recycling woolen items as well as finding wool through a wonderful estate sale! It is a work of passion and love versus getting rich! What I make on my sales usually goes to purchase other materials and threads to keep me sewing! order and detailed with beads as well as embroidery and special decoration. Sample of two- tone wool pincushions. Sample Fruit Pincushions. Sometimes I add detail to the leaves. Flower Pot Strawberry Plant Pincushions. Detail work is what I most enjoy doing as you will see in much of my work! quilted. Maybe soon. Good thing I am patient and persistent! Winter Sampler on my Penny Rug Sampler Quilt. I started making penny-rugs some years back and soon made them into functional pincushions and then extended my work with wool to create soft sculptures of various shapes. These have included acorns, pots of flowers, cactus, owls, and chicken as well as doorstop hens. Whether you are a sewer and enjoy my pincushions to hold your pins and needles or just like to have some bright and colorful works of art to decorate your house, I think you will enjoy what I have done with this old art form.They will definitely be conversation pieces for years to come and some people use them as paperweights or pin notes to them. meaningful and personal gift and that he still has it, silly as it was! I have extended this sneak peak to include a few other pictures to show what can be created out of wool... I have a detailed lap robe in process, a wool penny rug sampler quilt waiting to be quilted, as well as other small works of art, most of which will be at Maria and Jon's Open House on the 6th and 7th of October in Cambridge, NY. All are invited and I will post more information as the date approaches. Most of my customers are familiar with Maria Wulf and Jon Katz and know that Jon is a New York Times Best Selling Author, and photographer and now writes a daily blog, Bedlam Farm Journal. His wife, Maria Wulf, also writes a blog, Full Moon Fiber Art and creates special quilts and fabric art. Both of them enjoy their mini-farm in Cambridge, NY and have followers from all over the world for their blogs. I don't think I would be exaggerating to say that they are so involved in "good work" in their community and avidly support artists and writers too, but they also make significant contributions to world peace as they extend their love, friendship and service to anyone in need. To adequately appreciate all they do, tune into their blogs and definitely come to their Open House October 6th and 7th! Not to be missed either are their animals of Bedlam Farm. Jon has written about most of them and truly they are unique. I believe Red is still demonstrating his sheep herding abilities and Jon is always proud to show what he can do. Other friends and followers will be at this event, as well as the many who belong to their face-book Creativity group that support one-anothers' writing, photography, artwork and shared life's journeys. Their Open Houses are delightful and display what love and community are all about! I am blessed to be included in such events!